When you enjoy all of those holiday treats, think about the not-so-delectable foods devoured by Civil War solders encamped outside Murfreesboro during the winter of 1862. They "dined" on the staples long associated with cowboy movies _ beans, bacon and strong, hot coffee. Actually, both the Confederate Army of Tennessee and the Union Army of the Cumberland weren't starving, but their diets suffered from tedium. In the breadbasket of Middle Tennessee, foraging was a popular way of supplementing rations. "The forest and farms around abounded in sheep and hogs. In fact, Tennessee and North Georgia were not the worst places in the South in which to live through a campaign. 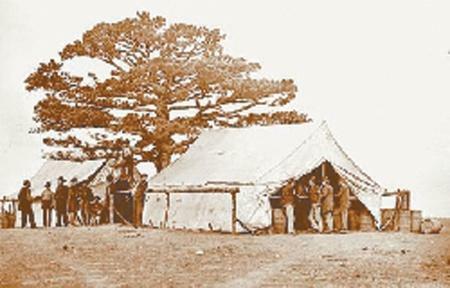 We had strict orders to protect all private property and molest nothing outside of camp requirements, but the men would forage at night, bring in a sheep or hog, divide up, and by the immutable law of camps it was always proper to hang a choice piece of mutton or pork at the door of the officers' tent. This helped to soothe the conscience of the men and pave the way to immunity from punishment," wrote D. Augustus Dickert in his "History of Kershaw's Brigade." Both the North and the South had rations, but nothing like World War II's K-rations or today's MREs. In the field, Union soldiers lived on hardtack, salted beef, beans and coffee. Southern troop's rations were similar but with a regional variation of corn meal, bacon, beans (goober peas) and coffee. It was a Tennessean, President Andrew Jackson who added coffee and sugar to the basic military ration back in 1832. He substituted them for the rum or brandy previously provided American fighting men. While Confederates sang songs lambasting "goober peas," soldiers in the field generally despised Union hardtack. Hardtack was basically flour and water baked to the consistency of a brick. Usually, a hard bread biscuit was about 3 1/8 inches long, 2 7/8 inches wide and a half-inch thick. If boxed too soon, the hardtack usually was moldy. Often it was infested with weevils. It was too hard to eat unless it was soaked in water or boiling coffee. Often it was added to a soup made up of meat scraps and the dried vegetables included in the basic ration. Sometimes, the troops made "sillygallee" by soaking the hardtack in water and then frying it in pork fat. As in most aspects of the Civil War, the North had the technological advantage when it came to food. Canned milk, beef and vegetables were sometimes given to troops, but there has been much speculation on just how many soldiers the canned beef killed. There were even Congressional investigations at the time. But at least one Civil War era canned product remains in production, Borden's sweet condensed milk. Sometimes, Federal soldiers got a treat _ a can of sweet condensed milk _ and they made a concoction they called "milk toast" with hardtack. Gail Borden was awarded a patent for sweetened condensed milk in 1856. Sugar was added to prevent bacterial growth. Borden first thought the condensing process made the milk more stable, but later learned it was the heating process that killed the microorganisms that spoiled milk. As for the Confederates, there was a little less variety in their rations, but the corn meal proved a little more palatable and versatile than hardtack. Unfortunately, it could be rancid, moldy and bug infested as well. Most often, the corn meal was mixed with a little water and a pinch of salt and cooked into what's still called hoecakes in the South. Often they were cooked on a flat rock or right on hot ashes. It could also be cooked into gruel for a warm breakfast. But when troops were on the move or getting prepared for a battle, they often didn't have an opportunity to cook. In that case, they were normally ordered to cook-up two, three or four days of rations. "Now corn bread is not a very great delicacy at best, but when four days' old, and green with mold, it is anything but palatable," wrote Dickert. To avoid this dilemma, Confederates made what they called "cush." "For the benefit of those Spanish-American soldiers of the late war, who had nothing to vary their diet of ham and eggs, steak, pork, and potatoes, biscuits, light bread, coffee, and iced teas, but only such light goods as canned tomatoes, green corn, beans, salmon, and fresh fish, I will tell them how to make "cush." You will not find this word in the dictionaries of the day, but it was in the soldier's vocabulary, now obsolete. Chip up bacon in fine particles, place in an oven and fry to a crisp. Fill the oven one-third or one-half full of branch water, then take the stale corn bread, the more moldy the better, rub into fine crumbs, mix and bring the whole to a boil, gently stirring with a forked stick. When cold, eat with fingers and to prevent waste or to avoid carrying it on the march, eat the four days' rations at one sitting. This dish will aid in getting clear of all gestion of meat and prevent bread from getting old. A pot of "cush" is a dish "fit for a king," and men who will not fight on it would not fight if penned," Dickert said. Now maybe you understand why foraging was so popular among troops. A good cup of coffee was truly treasured in those days and again here Northern troops had the advantage. The federal quartermasters made it a practice of buying the best coffee beans available and those were issued to troops in either green or roasted form. Camp rations were generally, 10 pounds of green coffee, or eight pounds of roasted and ground per 100 soldiers. Coffee drinking was a safety measure supported by people like Florence Nightingale and the U.S. Sanitary Commission because the boiling process killed water-borne pathogens that caused dysentery. Disease killed many more soldiers than combat did. During the war, Union forces lost 110,070 men to battle deaths and 250,152 to disease and other causes. The Confederates lost 94,000 in battle and another 164,000 to disease and other causes. After the Battle of Stones River, the Sanitary Commission helped improve conditions at Fortress Rosecrans and in the Union camps around Murfreesboro. Usually, Confederate soldiers had to make do with some sort of coffee substitute, none of which really tasted like java. Lincoln's blockade of Southern ports virtually dried up the Southern supply of coffee by 1862. While chicory was the preferred alternate, all sorts of things were tried including roasted bread crusts, rye grain, barley, beans, beets, bran, chestnuts, corn meal cotton seeds, dandelion, okra seeds, sweet potatoes, peas, peanuts, persimmons, rice, rye sorghum molasses, sugar cane seeds, watermelon seeds and wheat berries were parched, dried, browned or roasted to make a drinkable beverage. One of the most common alternatives was acorns, which were parched, roasted in butter and ground. Nasty! Peanut coffee called for 1/2-cup peanuts, 1/2-cup wheat or rye and 1/2-cup cow peas. The beans were roasted to a coffee brown and then ground. Postum, which was developed by C.W. Post in 1895, was made from toasted wheat bran, wheat, molasses and corn syrup, and is still commercially available. At Stones River, Confederate troops launched their attack at about 7 a.m. on Dec. 30, surprising the Army of the Cumberland. "But about 7 o'clock the rattle of musketry and roar of artillery announced the beginning of the conflict. The enemy was taken completely by surprise. General and staff officers were not mounted, artillery horses not hitched, and infantry not formed. A hot and inviting breakfast of coffee and other luxuries, to which our gallant and hardy men had long been strangers, was found upon the fire unserved, and was left while we pushed on to the enjoyment of a more inviting feast, that of captured artillery, fleeing battalions, and hosts of craven prisoners begging for the lives they had forfeited by their acts of brutality and atrocity," wrote Gen. Braxton Bragg in his official report. You have to wonder just how many Confederates passed that coffee without taking at least a sip.